Acrylic & Sand 20" x 30" $1800. For Native Americans, the coyote represents the trickster. They say he teaches us lessons in the most unusual ways. He is also considered the most adaptable animal in America, today. I always admire this valuable trait – adapting to our ever changing life and environment. I painted the first coyote last winter. To my surprise, I felt somewhat compelled to study the mysterious creature, who sings to us in the desert night. Paintings of the coyote never come easy for me, as I continually work through the painting with many, many layers until the image feels complete and the coyote has found a comfortable setting. 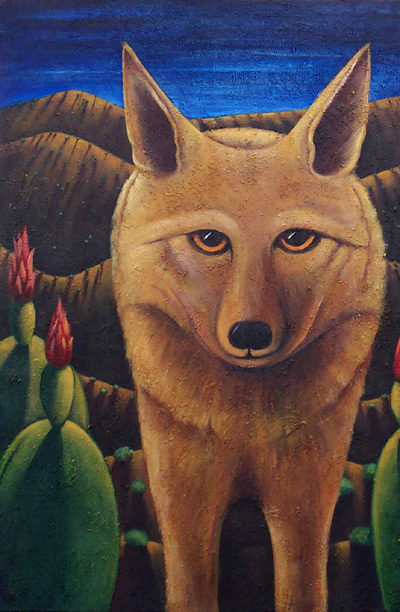 In this particular painting, there are cactus on each side of the coyote with red blooms resembling torches. This imagery has come before in other paintings, and they always feel like lights – lighting the path. Here, they are lighting the way for the coyote. The hills in the background are the Cerrillos hills that I see out my front door. The beautiful light of New Mexico really does create long, extended juniper shadows that line the hillsides.